Your setup seems to be a little bit unfocused... I would recommend finding some way to get a MWD on there instead of the AB and then using a scrambler so that you can close in on people and then keep them from getting range on you. I generally fly my Vexors to either be flown at point blank range (1600mm plate tanked or super gank fit) OR to be flown at 20-25km nano range (railguns and valks and nanos in the lows). In my personal opinion it helps to focus on being as effective as possible in only a couple aspects instead of trying to be OK at all of them. 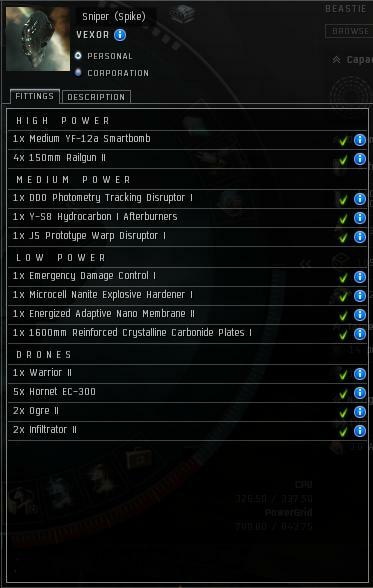 Also, you should see if you can upgrade some of those mods to best named or even better, T2. The damage control, the plate, etc. Lastly, a smart bomb may not be a good idea in a ship where you're going to wind up nuking your own drones. Maybe a neut or nos instead? Everything Spectre said is 10000% correct. As far as drones go, you could 2:2:1 if you really wanted (though I'd change the Infiltrators out with Hammerheads), but the small drone bay makes that a little too much of an eggs in a basket problem (basically, a frigate could kill your Vexor given enough time), and I personally don't go 2:2:1 until I get the extra space of a Myrm. I'd go a flight of Hammerhead IIs, Warrior IIs, and EC-300s, if you're set on ECM drones. However, PvP, like all things, is very personal and dependent on practice. Use whatever works best for you, of course. I would suggest that when you're starting at PvP, a close range fit is always preferable. Maintaining range is a bit harder than just closing and blasting the crap out of someone. That'd be blasters, not rails. A NOS is also preferable to a smartbomb(which is always a bad idea on a drone focused boat). Being unable to fire is a bad thing, and if you get neuted, that will help. I suggest a spread of 5 Hobgoblins, 5 Hammerheads, and 5 ECM drones. Having spare drones is way more important than maxing out the damage on one flight. Not to mention the options of having two sizes. I suggest those mids be a MWD, long point, AND short point. You will be closing range, but having that long point to start with won't hurt. It'll also be more useful than that Tracking Disruptor. You skimped on the lows, price wise. That's fine, only fly what you can afford to lose. The 1600 rolled tungsten can be expensive, but there's no reason except for difficulty in fitting to skimp on the damage control. Especially if you fly a lot Gallente ships. Always use a Damage Control II. Next time just copy/paste from EFT though, way easier. CK - you've got some great advice above; Spec, Hallan and Arrhi all know what they're talking about. Let me add my 2isk. 1. Get rid of the smart-bomb and replace with a neut OR a small remote armour repairer. You want to repair your poor drones right? A smart bomb on your own drones will make you cry. 2. Decide on whether you want to go in close and in your face or dance like butterfly, sting like a bee. Right now, your fit isn't optimised for either. 3. I would recommend the up close and personal school of play. So in the low slots slap on a 1600mm rolled tungsten plate, Damage Control II, EANM II (x2). Consider fitting x3 Medium Trimark rigs - will increase your armour buffer nicely and while the cost will go up, there is no feeling like winning a fight. 4. Mid slots: MWD, a short-point and a tracking disruptor. The TD should make most turret based ships really miss your small zipping drones! However, an alternative would be a webber or a long point. 5. High slots: small blasters with either a neut/small armour repper. Your main damage should be through your drones but am unsure what drone skills you have. Fly the ship with no fear. Any hesitation and you will lose the first round, if not the fight. Don't release your drones until you have 1) a point on your target and 2) that the target is shooting YOU. If the target is shooting your drones, scoop them back in to save them. Release them again to attack your opponent. Use your remote repairer when the fight is over. Good luck. I know where Ebodold is. See you! Thank you all for your precious advice. I'll rework the setup and make a new post about early next week! Will again welcome your advice! Cheers, and good hunting! I sense that Ebodold is about to become a very popular tourist attraction. I agree with just about everything that has been said. I'm not so famous as the rest of these guys, but I did want to emphasize the point that was already made (so you realize how important it is) that you ought to fit a damage control II -- the skills for it do not take long at all (Hull Upgrades IV). 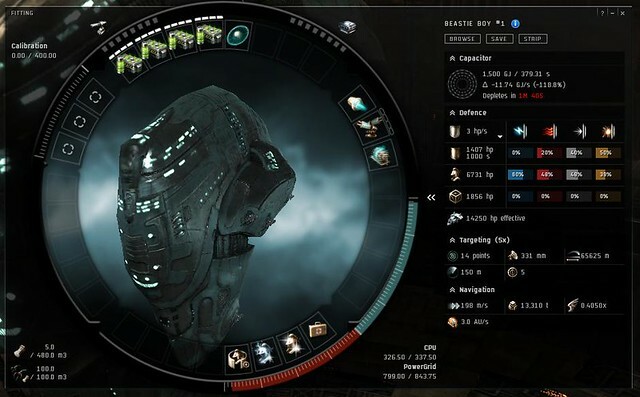 On a ship like the Vexor with as much structure as armor, you'll want to maximize the resistances on both. There's a 4% difference in armor resistance bonuses and an 8% difference in structure resistance between the Emergency Damage Control I and the T2 module. That adds up faster than you imagine if you've never pvped before. My comment on you fit is that it fails to be able to dictate range at all. It seems to want to take on an enemy between 10 and 20km, however there is nothing that you have fit that will actually do this. With your AB most ships smaller than a dread will be able to escape your warp disruptor and escape or get in close and pulverize you. My suggestion, like others, is to go maximum close range gank with a scram and a web. Hold down the enemy and blow them out of the water. You can make adjustments to the fit based on your skills, but that fit has good tackle, good frigate counters, and a thick (for a T1 cruiser) buffer. I don't know if you've gone to that plex in Ebodold yet, but in my memory the largest ship allowed in was a Destroyer. That said, I ran that plex quite easily in an artillery-fit Probe, so I don't think you'll get any results worth your time even if you can get a Vexor in there.